Alfredo Muro’s concerts unfold for audiences as a personal and unique experience of emotional awakening, bringing much more than just strong technical talent to the stage. He brings an intense love for the music he chooses and performs with such great sensitivity and emotion. He has the rare ability to become the music, losing himself in it and enabling the audience to transcend their own experience and share his. While this is evident on his many recordings, it is in live performance where this manifests most strongly. Guitar works by Jobim, Celedonio Romero, Piazzolla, Barrios, Lennon & McCartney & more! 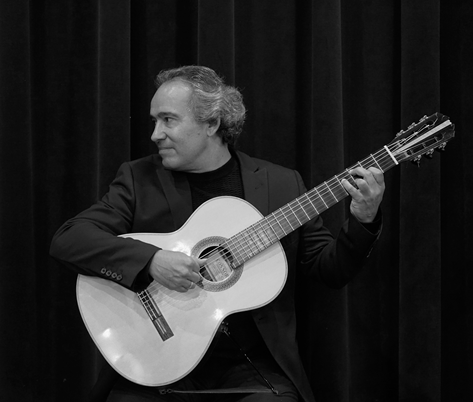 Alfredo Muro shares the joy of his musical talent while performing, composing and teaching throughout International Guitar Festivals, concerts, lectures or coaching/teaching at his Guitar Studio. These three passions provide the basis for the phenomenal success of this musician and his ongoing and constant evolution. This year 2019, looks very exciting with many projects, including three tours to the United States of America: Florida, Colorado and Oregon, participating in the renowned Big Art Festival in Sanibel Island, celebrating it’s 40th. Anniversary, along with great artists like Sharon Isbin, Judy Collins, Dover Quartet and Pacifica Quartet. Continuing with a European tour: France and Spain and for the very first time performing in Africa in Mauritius. Also, this year Alfredo Muro will be recording two new CD projects dedicated to the music of the Latin American giants: Astor Piazzolla & Antonio Carlos Jobim and the recordings of his own compositions and the premiere recording of a Brazilian Suite, composed by Brazilian guitarist composer Jose Barrense-Dias and dedicated to Alfredo Muro. From intimate house concerts to packed concert halls and each time the music rises from where he sits and extends his embrace to those in attendance. It bows to our inner dancer, extends it’s hand and draws us under his spell. Sometime later the audience awake to their own thundering applause, wondering how their hearts can be so full and their smiles so wide. This is how it’s supposed to be. Alfredo Muro is an artist sponsored by Knobloch Strings. Alfredo Muro, Peruvian interpreter, composer, arranger and improviser began his guitar studies teaching himself to play his beloved instrument and he progressed rapidly. He was soon awarded a scholarship to train with Maestro Pepe Torres. In 1971, he along with his sister Connie Bieberach won the year-long TV program, Trampoline to Fame. At age thirteen, Alfredo took the top prize in a nationally televised competition, featuring musicians from more than one hundred schools. He continued his studies with two of the greatest Peruvian guitar masters know, Octavio Ticona and Carlos Hayre, gaining mastery of harmony and the rich variety of Peruvian folklore. These experiences were complement by four years of intense studies with great masters Manuel Lopez Ramos, Frank Costa, John Doan and Alfredo Escande. Also, studies Harmony and Counterpoint with the distinguish Mexican Maestro Jose Suarez. Alfredo Muro had the honor of representing Peru and the USA in several International Guitar Festivals in Chile, Argentina, Peru, Brazil, Dominican Republic as well as Mexico, Canada, Italy, Germany, Austria, Norway, Japan and four tours to Taiwan. While on tour in Europe, Alfredo Muro played with his group Oro Del Peru for the late Pope John Paul the Second at a “Special Audience” at the Vatican. Alfredo Muro has presented concerts in many venues throughout the United States. He had the privilege to be the featured artist at the Kennedy Center for the Millennium Concert Series in Washington D.C, at Benaroya Hall in Seattle and at The Smithsonian Museum. Also, he has had the privilege of performing in the Hall of the Americas for the Organization of American States. His arrangements, transcriptions, and articles have been published by the Peruvian music magazine Cuadernos de Musica Peruana, in its Edition #13. In March of 2005, Alfredo Muro was selected for the Jack Rosenberg Memorial, Musician of the Month Award, by the Jazz Society of Oregon in their Jazzscene magazine. The Centinela Newspaper in Portland, Oregon, featured Mr. Muro as the “Hispanic of the Month”. The Hispanic Yellow Pages Directory introduced him as the “Pride of the Hispanic Community”. In July 2017 he was nominated for the Añomi Advertising Agency and the Latin American Association of Writers and Artists, receiving the Eureka trophy for Quality and Artistic Excellence, for his artistic career as well as receiving a Diploma of Honour in Humanistic Ethics. In May 2018, he participated in the renowned Encuentro Internacional de Guitarras de Salamanca-Mexico as well as playing for the very first time in Japan. In November of 2018 he was invited to play the Suite Indiana concert with the Orquesta Sinfonica de la Universidad de Guanajuato OSUG.